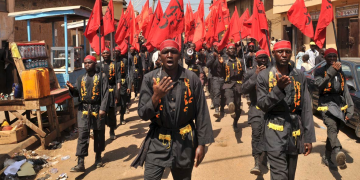 A spokesman of the Islamic Movement of Nigeria (IMN) on Thursday declared that the group’s association with the government and people of Iran is not designed to subvert the Federal Government. Malam Mohammadu Ibrahim Tamawa gave the assurance when he spoke with the News Agency of Nigeria (NAN) in Abuja on Thursday. He said that the relationship his movement has been sustaining with the Iranian government is comparable to the link between the Pope and the Catholic Church in Nigeria. He said that if the Catholic Church in Nigeria could maintain such a relationship with the Pope, there is no reason IMN could not engage the Iranian government in a similar way. Tamawa said that no Catholic Bishop cold be ordained in Nigeria without the authority of the Vatican and the Bishop of Rome (The Pope). ‘’The same is true of the relationship between the Anglicans and the Archbishop of Canterbury,” he said. The spokesman said that his movement has not engaged in forced conversion of people to Islam. Tamawa urged the Federal Government to charge to court members who had violated the law of the land. ‘’We are ready to go to court and we believe that Nigerian judges are independent. The rules are there. ‘’ Our ‘Arbaeen’ rallies this week were meant to commemorate the death of Imam Hussein, the great grandson of Prophet Muhammad. He said the members of the IMN were responsible citizens who, as a group, constituted the largest group of blood donors to the nation’s blood bank, including for the military. Tamawa said his group would continue to stage rallies to commemorate religious activities.